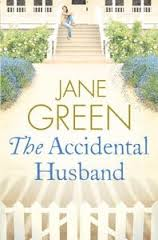 It's been difficult to pick a Book of the Month for June as I've read some fantastic books and it was a toss up between The Accidental Husband by Jane Green and The Road Back by Rachel Abbott. The books are very different but they've been battling in my mind to become Book of the Month since I read them early on in June. But, after a LOT of thinking, I decided to fly the flag for chick lit and picked The Accidental Husband, which I thought was a fantastic read. I was hooked from the very beginning, desperate to see how the women would react when the big secret was revealed.